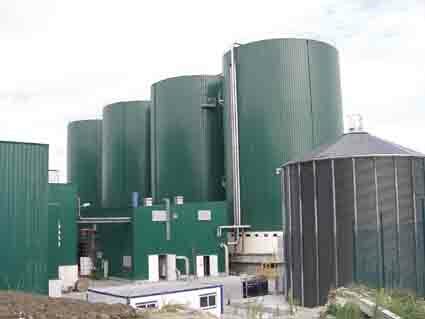 Tagged AD plant, Anaerobic Digester, Anaerobic digestion, Biogas, Biogas Holder, biogas storage, CHP, description of biogas plant, desulphurization, Dewatering, digestate, effluent treatment plant, electricity, Fertilizer, manure, process flow of biogas plant, SCADA, working of biogas plant. Bookmark the permalink. Canadians have run cars and trucks for decades on CNG 9Compressed Natural Gas) and methane form Anaerobic digestion – gas is stored in common “propane tanks” works just fine! In this very cold and “Heat Concious” country, we would rather pipe gas to the point of use, and enjoy the heat as well as the service rendered! Honda sells a home heating/ electricity generating plant for Canada. Germany has done this for years. Austerity and plain Canadian frugality demands the very cheapest smartest solution at all times – unlike our American cousins we cannot bear waste of any kind. Ontario dairy farms currently and commonly “poop-powered” most the heat and electricity locally generated. Good on you for finally putting sewage to a better use than polluting your own drinking water! We are an international EPC who does alot on the construction. We are capable of EPCC and also a developers. WE are looking at green energy and is there any new projects taking place in Malaysia which can participate. There is an availability of 250 ton cow dung every day. How the commercial power plant can be run from that ? What would be the outcome of energy from approx 250 ton cow dung & what would be the approx project cost ? One more thing is that what is the best usage of different kind of waste outcome from a city to dispose off the same ? A biogas plant based on 250 tpd of cowdung will produce atleast 10000 m3 of biogas. Each m3 of biogas will give around 2kWh of usable electricity.